It’s been a while since we did a Fritos Friday, hasn’t it? So far we’ve done Fritos Jets, Fritos Chocolate Crunchies, and my favorite, Casey’s Fritos Ballpark Toffee. Since everything we’ve done for Fritos Friday so far has been a sweet treat, I decided this Fritos Friday should be in the savory vein. Fritos are pretty darn versatile ingredient. 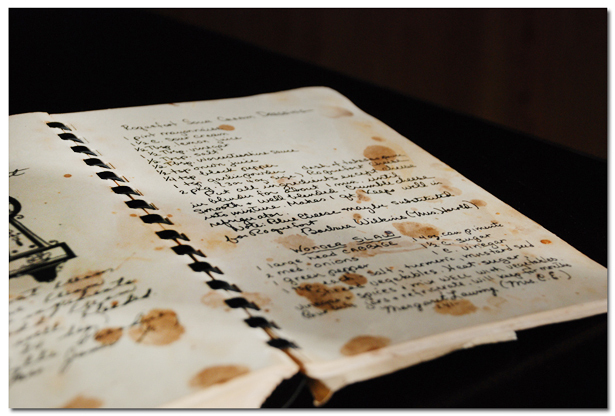 Paging through Koleta Doolin’s book, Fritos Pie: Stories, Recipes and More, even for just a minute, will tell you that. One of the recipes that caught my eye because it’s repeated throughout the book is a simple Fritos covered baked chicken, hereon out to be known as “Fritos Fried Chicken”. Fritos Fried Chicken – such a happy turn of phrase – it literally makes me smile when I say it out loud. The best thing about this particular fried chicken? It’s actually baked! 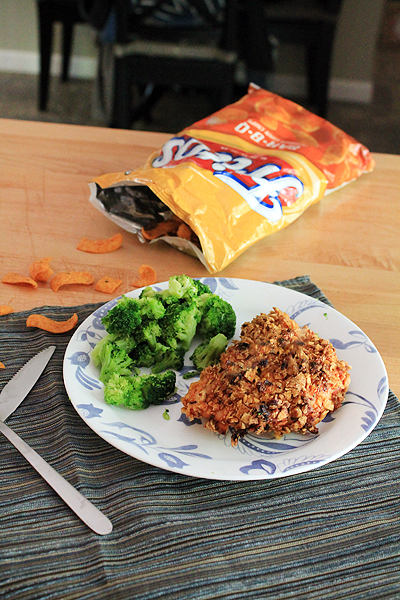 Confession: before making this chicken, I’d never in my life tried Barbecue Fritos. Normally I can’t stand barbecue flavored chips. I don’t know why that is, but they have never appealed to me. And get this: the Brit doesn’t really care for Fritos! True fact, I’ve been eating all those Fritos treats along the way by myself. (Not that I’m complaining!) But we both tried the Barbecue Fritos as I was making dinner, and we both loved them! For me, it’s all about the corn undertone mellowing out the barbecue flavor. For him, it’s the exact opposite. Either way, we’re both pretty smitten. Bake the chicken – be it thighs, breasts or legs – on a cookie sheet lined with parchment paper and a cooling rack. Baking the chicken on top of the rack instead of directly on the pan allows air to circulate around the entire piece of meat, and the Fritos will stay crisp on all sides. We served our dinner with steamed broccoli, but sweet potato fries and green beans would do just as well. Preparation is easy, just remember that the chicken needs to bake for about an hour – so plan your dinner time accordingly, rather than starting late and eating at 9 p.m. like we did. 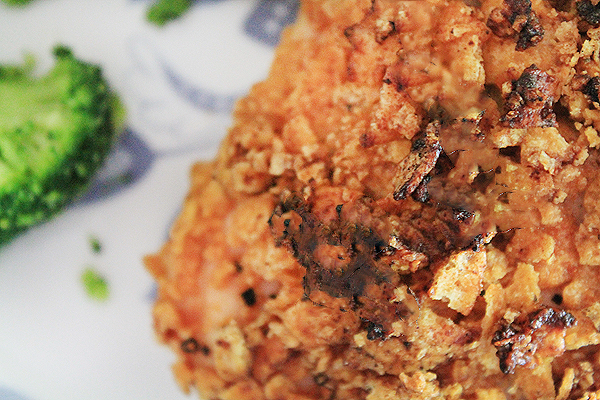 The crunch on this chicken gives Shake n’ Bake, Panko bread crumbs, or regular frying a run for its money. I hope you love it! Preheat the oven to 425°F. Line a baking tray with parchment paper and a wire cooling rack. Place Barbecue Fritos in a gallon sized ziptop bag. Seal the bag, pushing out as much air as you can. Use a rolling pin to roll over the Fritos in the bag repeatedly, until you have breadcrumb sized pieces. You can also use a food processor to accomplish this. Add two tablespoons of buttermilk powder to the crushed Fritos and shake the bag. (This step is optional, but I thought it added nice flavor.) Pour the crushed Fritos onto a large plate and set aside. In a medium bowl, crack two eggs and add milk or half and half. Whisk the eggs and milk together until fully combined. Take a fully defrosted piece of chicken, dip it into the egg wash to coat completely, the sprinkle the egg-coated chicken lightly with your favorite barbecue spice mix or rub. This is entirely to your taste, so sprinkle as little or as much as you want. Then dip and roll it into the crushed Fritos on the plate. Repeat the dipping process once more with the same chicken breast, essentially “double dipping”. No need to season again on the second dip. Place the coated chicken breast on the wire cooling rack that is set into the baking tray and repeat the process with the remaining pieces of chicken. Bake at 425°F for approximately an hour. If the Fritos topping starts to get darker on top, lightly cover with a piece of foil to prevent over-browning. The chicken is done when it reaches 180°F when pierced with a meat thermometer. Funny… I don’t like BBQ chips, but I do happen to like the Barbeque Fritos, as well. And, they used to make these twisty ones (that looked kind of like rotini pasta) with BBQ flavor… I ate a few too many of those in college. Ok, so on to the chicken… Wow! I remember you mentioning this one to me, but I just now saw the photos. I have to make this for dinner next week. This sounds ridiculously good. Pinned! I can’t believe you’ve never tried a BBQ Frito! Love them and this recipe. First, I LOVE barbecue Fritos. Do they still make the twirly kind that look like rotini pasta? Those are even more of a guilty pleasure than the regular barbecue ones. Second, YAY BUTTERMILK POWDER. That is all. You are a genius, MJ. New Fritos Friday post, comin’ up!